Have you gotten into the Quinoa craze yet? Quinoa, pronouced KEEN-wah, is an ancient, whole grain. It’s recent spike in popularity is due in part to quinoa being naturally gluten-free. Meaning, everyone who has Celiac disease or is choosing to eat a gluten-free lifestyle, can enjoy this slightly crunchy grain. 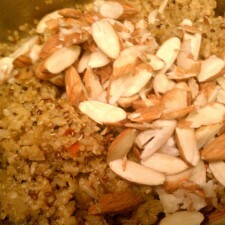 Quinoa is also a complete source of protein and a good source of fiber. 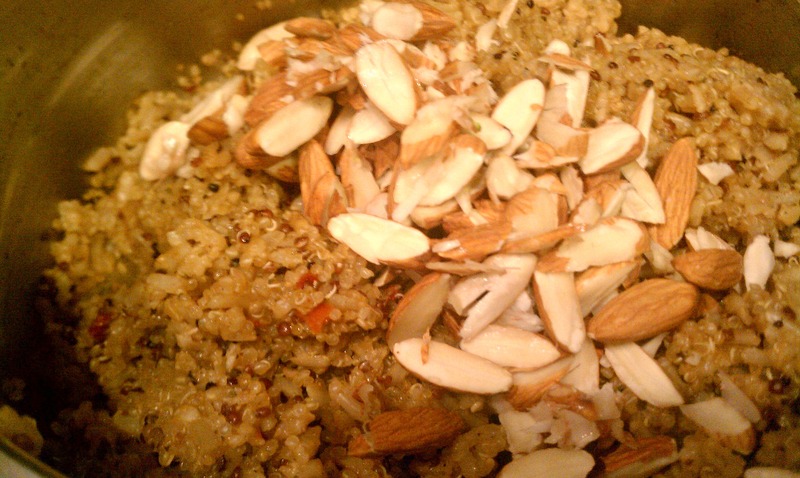 Here is a recipe for quinoa, using sliced almonds since today is National Almond Day! Bring 1 and 3/4 cups water and 1 teaspoon coconut oil, to a boil in a medium saucepan. Add 1 cup quinoa. Lower heat to medium. If using a boxed quinoa, add contents of spice package and stir. If not, add salt, pepper, garlic to taste. Continue to boil gently for 15 minutes or until water is absorbed. Then cover, remove from heat and let stand 5 minutes. Mix in additional ingredients for more flavor. I used chopped red pepper and sliced almonds. Serve as a side dish or add to a leafy green salad.